Mexico Beach Florida: One of the best Florida Beaches. Great beach here and a town filled with an old-world charm! The charm comes from the appreciation, preservation and maintenance of historical icons of past generations. There are no big hotel or restaurant chains here and the locals of this small, peaceful beach town like it that way. The local folks make you feel right at home. There are a lot of older homes and buildings here that have stood the test of time and are still standing today with pride. Some might say it’s in need of some updates, but others would disagree that it has an old-world charm that is unmatched here in the Florida Panhandle. A quiet fishing town, the pier here is a favorite feature of many because it offers a quiet solitude unlike any other and lets you gaze upon miles of untouched pristine beach. If you’re just looking for a peaceful, relaxing day of family beach fun, a visit to Mexico Beach Florida is in order. You may want to purchase an inexpensive raft to float around on while you ponder the intricacies of the world or, do what I do, sleep! 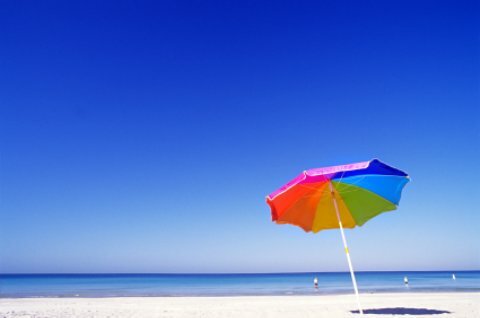 Never go to any beach without your water, hat, sunscreen and sunglasses! If you forget, you may forfeit all your whining rights. At my house, no whining if you haven't taken necessary precautions. You won't feel the burn until later and then it may be too late; your vacation may be ruined. Visit Thyndall Air Force Base to experience a true military community. There are some nice beaches here too. Located close to Mexico Beach is the historic shopping district of St. Joseph Bay, which consists of charming boutiques and art. You’re sure to find unique souvenirs or even decorations for your home here while you make friends with some of the local shop owners. Tour this untouched historic beach community aboard a charter boat at Charisma Charters or get an educational sigh-seeing tour at Shark Hook Guide Service. Kids of most ages: For young adults and teens, you can rent a jet-ski at Crazy Waverunners for a very exciting afternoon of water play. Eating: All of the little quaint restaurants offer their own charm, but Killer Seafood lives up to its name with its delicious creations. For some down-home cooking the entire family will enjoy, try Foody’s. Sleeping: All of the hotels are pretty much independent and family-owned establishments that offer comfy cozy stays. At the Gulf View Motel they make you feel very at home and like one of the family, while El Governor Motel is along the same lines and is situated right on the beach.